I never realised that you could have so much fun with an axe. We recently had a large tree taken down by a couple of professional ‘Tree fellas’, who clearly knew what they were doing. 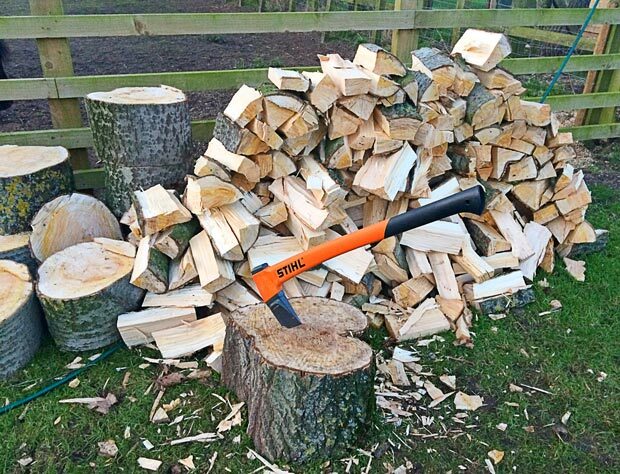 Afterwards I was left with a nice pile of wood and had planned to quickly make my way to the nearest axe retailer, to buy a whopper of an axe. My plan was then to turn the pile into wood burning stove sized logs. Well, as I often would, when I had professionals around doing jobs, I took the opportunity to get some tips for future reference. After speaking with them, I knew what kind of axe to buy, which was very different from the one I would have bought and after a demonstration I also knew how to efficiently cut through large rings of tree trunk. I was shown how if you get your axe stuck in a piece of wood, I should not do as I normally would and hit it harder and harder until its completely stuck fast but instead, flip the log over onto its back, whilst still stuck to the axe and then hit the back of the axe against the chopping base. By doing this, the weight of the log assists you in splitting it into two, just like magic. So, guess what I’ve been kept busy with since and I have in fact had various visitors, including my daughters fiancee chopping wood as a result, marvellous! I’d say it’s a very satisfying and fulfilling endeavour too. This last week I was told by a farmer friend that farmers should always carry in their pocket, ‘a knife, a piece of string and a shilling’. Well that got me thinking about what rubbish I have in my pockets. I decided to go through the pockets of my overalls and work jacket just to see what gems I would find. The first thing I found, in abundance, in several pockets was copious amounts of baling string. You see, it’s not that long ago when I wouldn’t have appreciated that string, but now there’s not many days go by in which I don’t use some string, which is very useful stuff. I then found my trusty knife, which is used very regularly, especially at feeding time, for cutting the strings around the bales of hay. I moved onto another pocket and found some cash, no shillings I’m afraid, but then again they wouldn’t be overly useful in buying anything nowadays. It’s funny but I don’t keep my cash in the same pocket as my knife, why? you may well ask yourself. It’s very like me, but it’s so the coins don’t scratch my knife, sad that isn’t it. So, my pocket raiding continued with half a pocket of rifle pellets, a range of different sized screws, nails, nuts, bolts and miscellaneous fixings, which I think are always good to have on hand. One top pocket was just full of old receipts and a felt tip pen. I found a number of dog poo bags, unused thankfully, although there is another tale to tell there, but that’s for another day. I went on to find a couple of pieces of broken pottery in one pocket and an old button, all which I will have picked up whilst visiting the hens, oh and my hanky which has probably been in my pocket since that great hay fever suffering summer of ‘76. It’s no wonder I’ve been walking like Quasimodo with that little lot weighing me down. I think it’s time for a clear out!